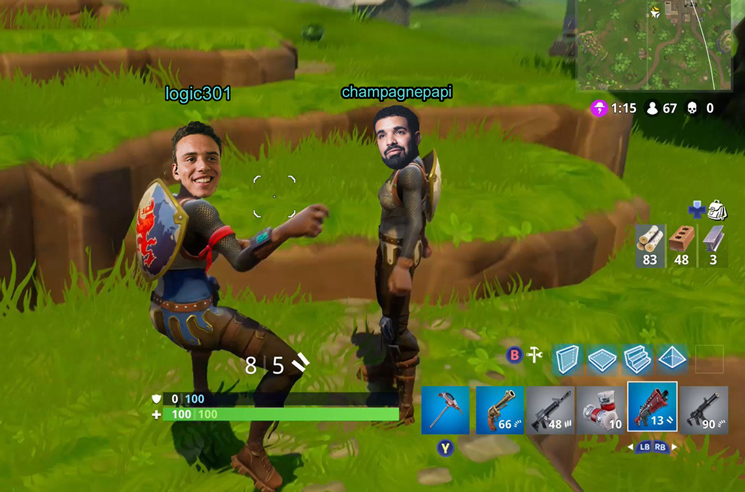 It's been a few weeks since Drake put on his headset and hopped online to play the wildly popular videogame Fortnite, shattering a Twitch livestreaming record in the process. After inviting the likes of Travis Scott and NFL-er JuJu Smith-Schuster to squad up with him and game streaming celebrity Ninja, other rappers wanted a piece of the 6 God in the online realm, including Logic. The night of the stream, Logic had tweeted at Ninja to "tell the boy Drizzy he don't want it with Bobby," a bit of goading that the MC has now taken beyond his Twitter fingers. During a performance on Ellen today, Logic challenged Drake once more after a run-through of his track "Everyday," asking the crowd to "tell that boy Drake he don't want it with me on Fortnite." Make no mistake, the two might not have enough hours in a day to work in a few rounds, with Logic having just released his Bobby Tarantino II mixtape and Drake up to some recording of his own. But now that the game has made its way from consoles and PCs to mobile devices, they might not have an excuse. Watch Logic's performance on Ellen in the player below.